Spokespersons from the organisations urge Mr Modi to act because his ‘ lack of action on this issue gives the shocking message that Dalit and oppressed caste lives do not matter in India’ . They urge him to act urgently to ensure that the self-confessed killers are brought to justice and that all the politicians, including senior BJP politicians, are dismissed from their posts, arrested and charged. We are deeply shocked by the recent horrifying revelations about the massacres of Dalit and other oppressed-caste people in Bihar and are writing to you to express our dismay that you have so far neither spoken out against the killers and their accomplices nor taken any action against them. 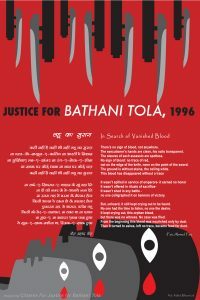 The Ranveer Sena, the upper caste landlord army in Bihar, perpetrated a number of major massacres of Dalits and oppressed caste people including at Bathani Tola, Laxmanpur Bathe, Shankarbigha, Miyanpur and Ekwari, between 1994 and 2000, brutally murdering some 144 men, women and children simply for demanding basic rights and dignity and for supporting the Communist Party of India(Marxist- Leninist) . 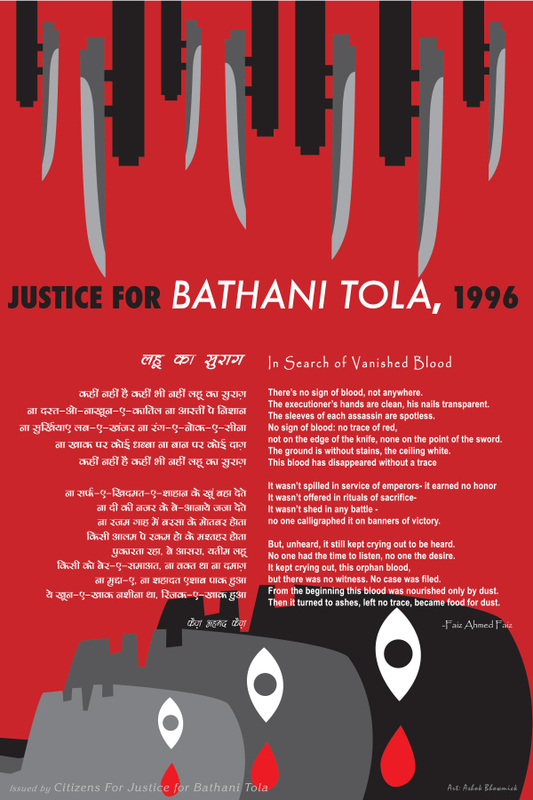 Ranveer Sena commanders (formerly acquitted by the Patna High Court) boasted in recorded interviews not only that they committed these massacres but that they were backed by top BJP leaders who were their political patrons and funders. They also confessed that powerful politicians helped them get arms and military training from serving and retired Indian Army men and that they had the support of former Prime Minister (the late Chandrashekhar), and top BJP leaders including former Finance Minister Yashwant Sinha, former Human Resources Development Minister Murli Manohar Joshi, former Deputy Chief Minister of Bihar, Sushil Kumar Modi and Vice President of the BJP, CP Thakur. The Ranveer Sena commanders also said on camera that Brahmeshwar Mukhiya masterminded all the massacres of poor Dalit women and children. Yet, as you know, the BJP’s Giriraj Singh has shamelessly described Brahmeshwar as Bihar’s Gandhi. The Amir Das Commission, which was set up in 1997, after the Laxmanpur Bathe killings, to investigate these massacres was disbanded in 2005 by Nitish Kumar of the JDU, then in alliance with the BJP, in order to appease and shield his erstwhile BJP allies. As you may know the Patna High Court acquitted all the perpetrators claiming there was ‘no evidence’, and that eyewitnesses were lying. The statements of the acquitted men to Cobrapost prove that the eyewitnesses told the truth. that the Army and ex-Army personnel who trained and armed the banned Ranveer Sena terrorists are also brought to justice.